With the light off, press and hold the FENIX switch for 0.5 seconds to turn on the light with the last used brightness. With the light off, press and hold the MINUS switch for 0.5 seconds to turn on the light with 200-lumen output. With the light off, press and hold the PLUS switch for 0.5 seconds to turn on the light with 5000-lumen output. With the light on, press and hold the FENIX switch for 0.5 seconds to turn off the light. Single click the PLUS switch, for each single clicking, the output will increase 100 lumens. Press PLUS switch over 0.5 seconds, then the output will increase 1000 lumens for each pressing. Single click the MINUS switch, for each single clicking, the output will decrease 100 lumens. Press MINUS switch over 0.5 seconds, then the output will decrease 1000 lumens for each pressing. In any status, press and hold the FENIX switch over 1.2 seconds to enter strobe, click once again to return to the last used brightness. With the light switched on, single click the FENIX switch to enter Turbo, click once again to return to the last used brightness. Lock: With the light switched off and unlocked, continuously click the FENIX switch twice within 0.5 seconds, the OLED screen will display locking icon, indicating the light enters locked status. Unlock: With the light switched off and locked, continuously click the FENIX switch twice within 0.5 seconds, the light will be unlocked and activated on last used brightness. In locked status, clicking or pressing any switch, the light will be unresponsive to indicate locked status. With the light switched off, single click the FENIX switch, the OLED screen will display the battery status percentage, and then goes out in 5 seconds. Charging: Plug the USB side of the charging cable into the any USB power supply, uncover the anti-dust cap of the light. And plug the Micro USB side of the charging cable into the charging port of the light. When charging the OLED screen will display charging icon, and current battery level will be displayed. The normal charging time is about 6 hours. Power bank function: Plug the USB side of any digital device into the USB side of the light. Then the light will display discharging icon when discharging begins. The max discharging current is 2A. The light can be turned on when it is in charging and discharging status, but only 100 lumens output can be reached. Once charging is completed, be sure to remove the charging cable and replace the anti-dust cap to protect from dust and foreign objects. The light will accumulate a lot of heat when it is working at high output levels. When the light is overheated up to 65 ℃ or above, the output will be automatically downshifted by the step of 1000 lumens until 2500 lumens is reached to reduce the temperature. High output levels can be reselected by pressing switch when the temperature is lowered than 65 ℃. 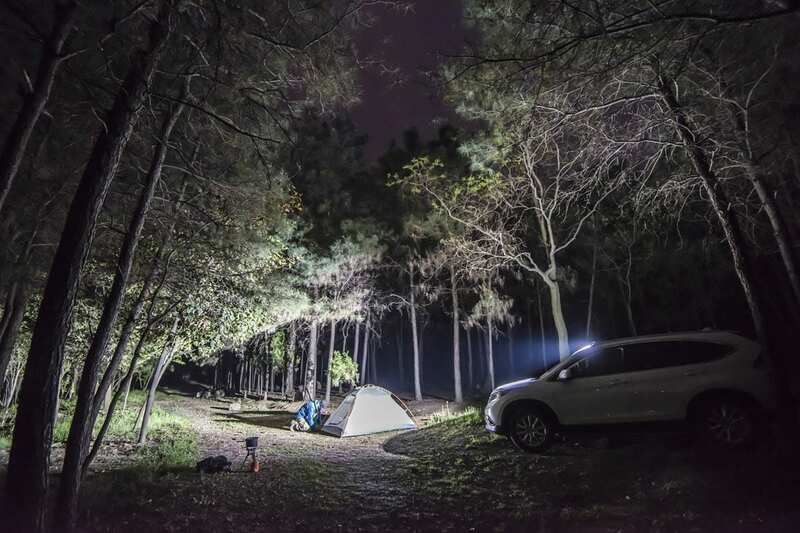 When the voltage level drops below the preset level, the flashlight is programmed to downshift by the step of 1000 lumens until 100 lumens is reached. Until the battery protection circuit activates to turn off the flashlight. The standardly configured battery is ARB-L45-14000 (7.2V/7000mAh), Fenix batteries with the same type can be used. Unscrew the tail cap to insert the included battery which features reverse polarity protection, so the anode can be neglected, then screw the tail cap back on. This flashlight is a high-intensity lighting device capable of causing eye damage to the user or others. Avoid shining the flashlight directly into anyone’s eyes. This flashlight is so powerful that it can cause a fire when holding the beam to flammable materials such as paper, cardboard, and more. Great light, but I was a tad disappointed that my FD40 (max 1000 lumens) at tight zoom actually puts out much brighter output then this. I wish Fenix had a lot more zoom style lights at higher power. I do not think its a 330 dollar light, but luckily I had a deal. This a top notch quality light! This is literally the sun in your hand. In both light output, and heat. Great size to power ratio, as well a solid flood pattern. LCD screens gives you appx run time, which is handy. Backwards charging so you can charge a USB device in a pinch if you need to. My only complain is the the power button is easily activated, even in the holster. I’ve melted some gloves in a backpack, as well as the bottom of the cup holder in my truck. Both are mainly my fault, but the lights “lock out” is easily overcome. A twist of the tailcap solves this problem. I will attest to it’s durability and resistance to heat. When it activated in my bag, it must have been on for well over 30 minutes at 9000 lumens. It was soo hot when I discovered it, that not only did I get burns on my hand, but the lens appeared “fogged” over and there was oil seeping from the metal. Once it cooled and I recharged it, I was pleasantly surprised that not only did it work flawlessly, the lens returned to normal and there’s no visible damage. Great light for my needs. Does get very hot on prolonged use at high lumens. This thing is brighter than the sun. Literally lights up the landscape like it is daytime. If you need this type of light, this is the tool. It has a very wide throw. Not good if you need a more narrow beam. This light is incredible! The ludicrous 9,000 lumen output ensures you will never be left in the dark. The OLED display and the three stainless steel buttons make mode switching a breeze. With an IP-68 waterproof and dust proof rating, you don’t have to worry about getting it wet or dirty. Would recommend to anyone who wants a durable, reliable, and powerful flashlight. I hate to deduct a star from this flashlight rating, but I have to concur with James on the subject of heat. This flashlight gets HOT to the point of burning. Other than that, a great light, very bright and compact. It is a flood light, so don’t expect it to have great reach, the specs say it can reach 900 feet, but I believe that’s a bit of an exaggeration. On the subject of its spread (flood) pattern, I should mention that when side by side with my TK16, the spotlight on the TK16 manages to look brighter, even when the TK72R is at or above the TK16’s max output. I still have to take this puppy out deeper into the woods, but I expect it to perform even better in pitch balck conditions. I plan to keep my TK16 on me, in case I need to be spotted from a greater distance. Nice wide, white beam with amazing power and intuitive controls. Love the USB recharge feature! Small enough to carry comfortably. Great build quality but hey, it’s a Fenix-what did you expect? Outstanding light! Another great flashlight from these folks-well pleased with my purchase The TK72R is a beast! Lights up the whole street. Awesome and very powerful. I just received my TK72R today; charged it until nightfall; and gave it my first test. At this point, I’m taking off one star only because the unit gets uncomfortably hot if used on powers > 3000 lumens for even a few minutes. There is a lot of power being generated here! 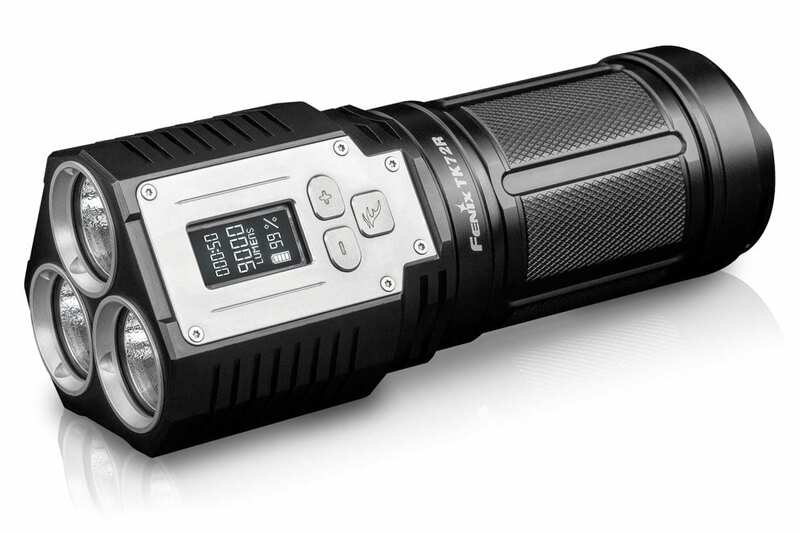 My purpose in selecting the TK72R was to provide more light than my Fenix FD40 (which I’ve used extensively for several years. It’s been my “go to” flashlight but even at 1000 lumens and with the focus set to as much spot as possible, it barely lights sufficiently to see my dark dog at 100-ft. We go walking every night and often encounter deer and wild hogs. The deer take off, of course, but the hogs are less predictable and I definitely need to see them better. Hence, and after much study, the TK72R. Here’s my first impression. To match the definition of my 1000 lumen FD40, I have to put the TK72R on 3000 lumens. This makes sense as it appears to have three “bulbs” and I expect each is putting out about 1000 lumens. However, the TK72R is not a spot and it brightens a very wide area. While the FD40 illuminates a swath of maybe 20-ft at 100-ft, the TK72R has the same intensity over a swath of at least 50-ft and 100-ft. This is obviously much more useful. 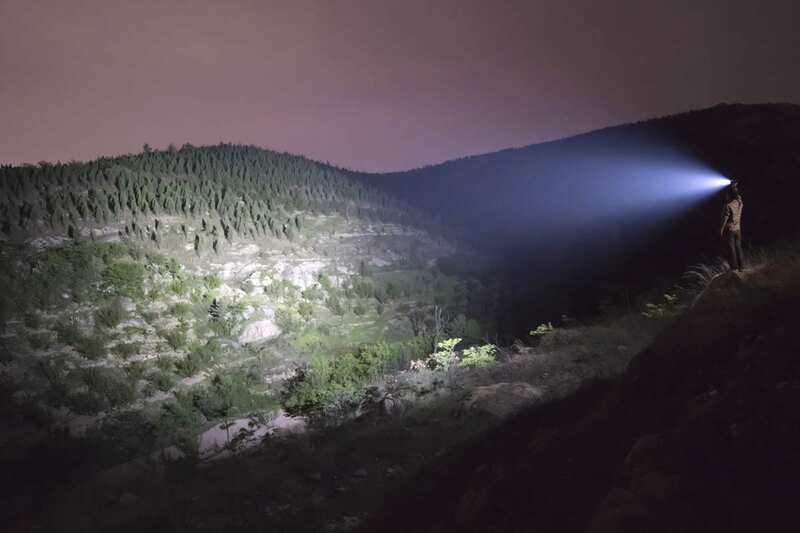 At the max of 9000 lumens, the TK72R appears to have about double the illumination of the FD40 (I understand lumens are not linear) and reaches with good illumination to maybe 200-ft. This is much less than the specs that you see but keep in mind that my idea of illumination is not based on a laboratory standard but is simply can I tell if my dog has encountered a skunk or a possum. My perfect light would have a little less spread and a little more distance; and wouldn’t get quite to warm. If Fenix allows, I’ll come back to this review after I’ve used the light a little more and expand on my thoughts. 16 out of 18 people found this helpful. Was this review helpful to you? My wife got me a TK72R for Valentines Day. Absolutely the most powerful handheld flashlight any outdoorsman could ever hope for! Amazing product!!! Attention ladies: if you are looking for the perfect gift for your husband, you can’t go wrong with this flashlight! Only one word to describe….INFREAKINGCREDIBLE! Happy Valentines Day, OZ!